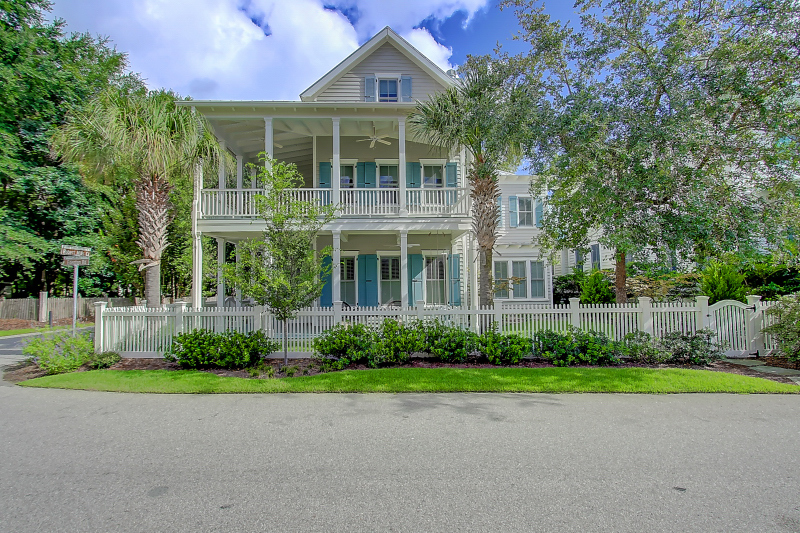 Located in I’On, 3 Robert Mills Circle combines classic Lowcountry architecture with high-end finishes to create a truly stunning custom property. The spacious home sits on the corner of Edenton Road and Robert Mills Circle–making the most of its corner position with expansive wrap-around porches, a fenced yard and detached guest house. Inside, the floor plan is bright and open with sophisticated finishes. The living and dining room are combined into one cohesive space which is perfect for everyday living or those who like to entertain. 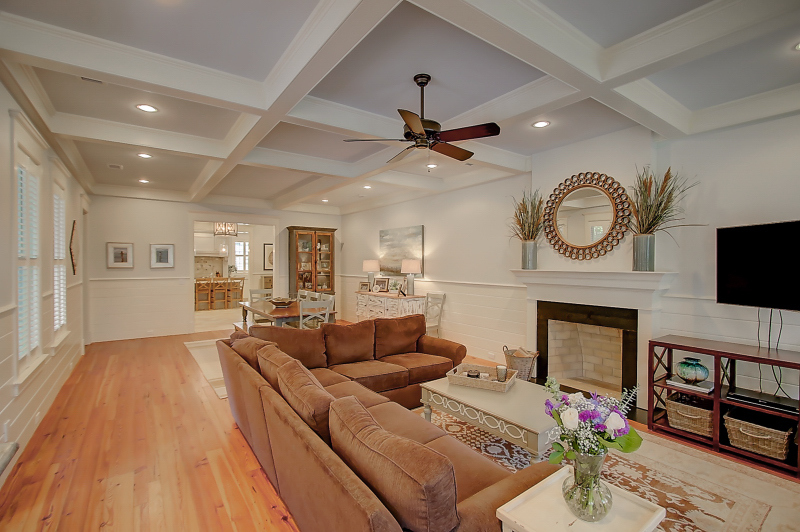 A coffered ceiling defines the space and nice touches such as shiplap accents, a wood-burning fireplace and detailed trim add further appeal. Just beyond this room is the beautifully appointed gourmet kitchen. Marble counters, white cabinets and high-end stainless steel appliances are both warm and contemporary. 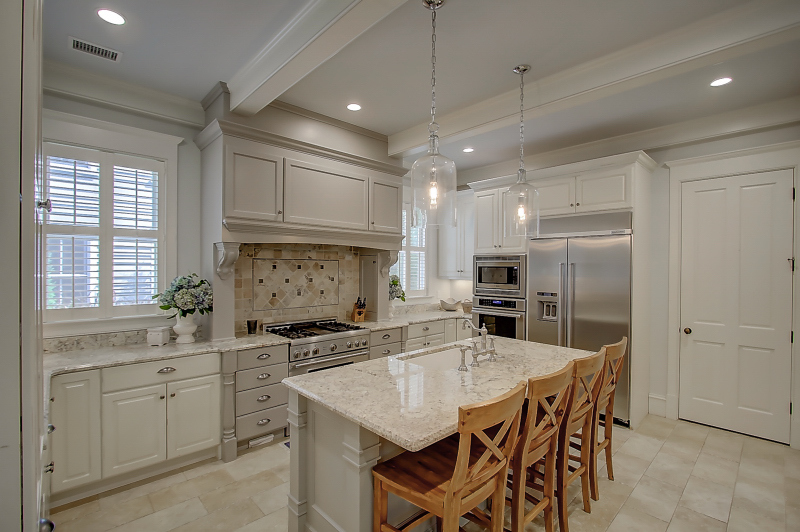 A center island provides seating for four and there is also a walk-in pantry. The foyer, separating the kitchen from the dining room, has a custom wet bar complete with glass-front cabinets for additional storage and a wine fridge. A unique feature of this home is that it has dual master suites–one on the first floor and one on the second. 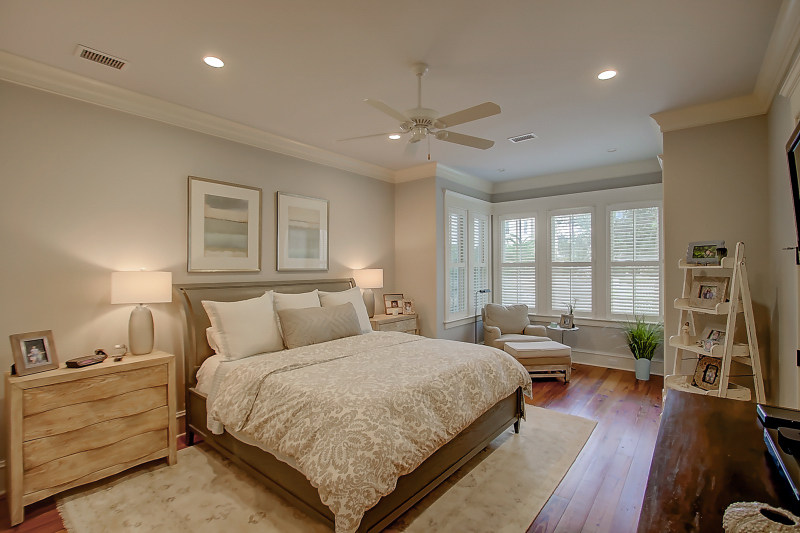 The downstairs master suite flows cohesively with the rest of the home, playing up a neutral color palette while drawing the eye to elegant finishes including 12’ moldings, heart pine floors, abundant windows and a sitting area. Features of the en suite bath include a claw foot soaking tub, a tiled shower and a long vanity with dual sinks and plenty of cabinet space. 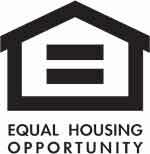 There are also dual walk-in closets and private patio access. 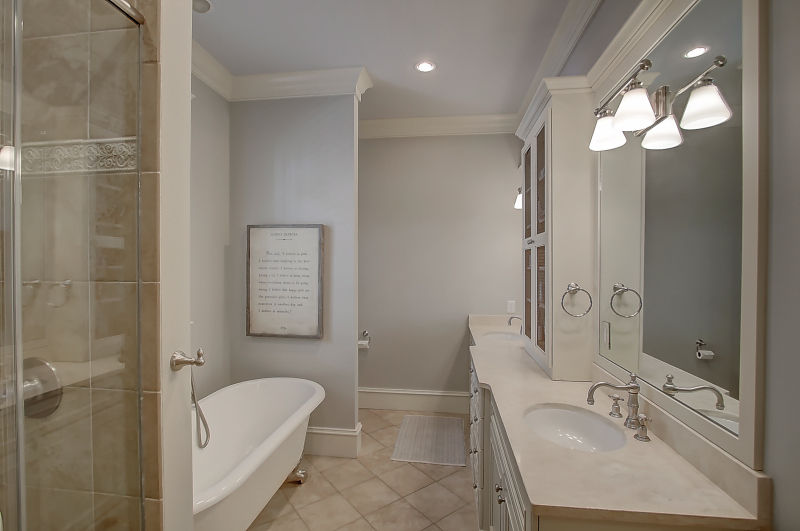 The upstairs master suite is a bit smaller, but it too has wonderful finishes including detailed trim and an en suite bath in similar style to the first floor master. The remaining two bedrooms on this floor also have en suite baths with tiled tub/showers and marble topped vanities. The home also has a ton of additional living space. 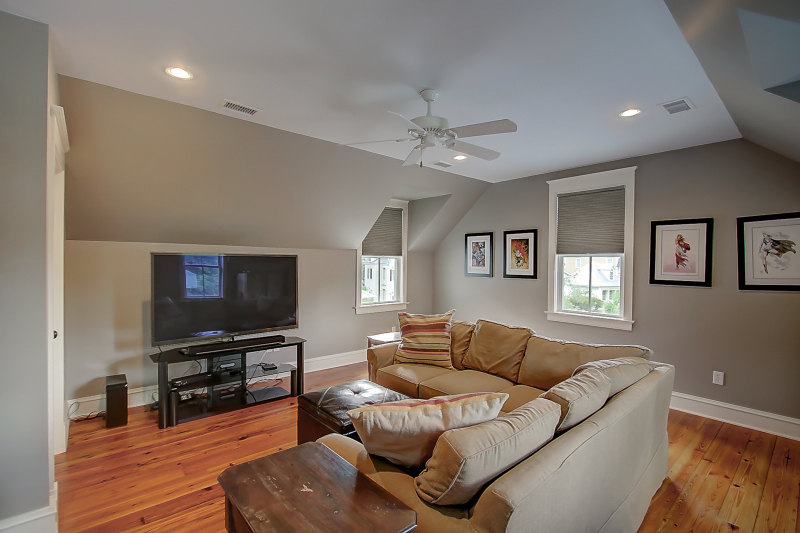 There is a second floor loft space, which is currently being used as a kid’s play area, as well as a finished third floor with an additional lofted space, a bedroom and full bath. A detached guest house, accessed from the main house by a covered walkway, features a large room and a full bath which is great for out of town friends or family. Other highlights include an elevator to all three floors, a freshly painted interior, new HVAC units (1st and 2nd floor), new landscaping, a brick paver patio, irrigation system and more. The I’On neighborhood is also extremely popular. 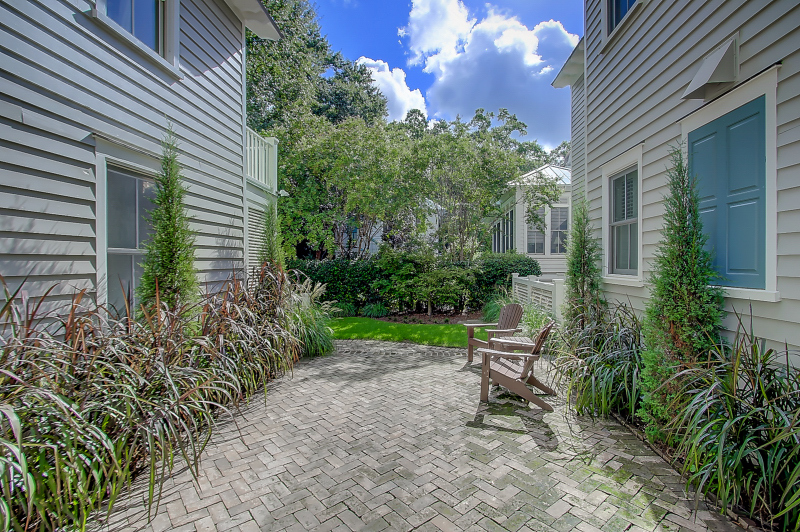 It is centrally located in Mount Pleasant–just fifteen minutes from downtown Charleston and the beaches. The picturesque community has beautiful tree-lined streets, neighborhood parks and the I’On Club–which includes clay tennis courts, three outdoor pools, a cafe and fitness center. For more information on the home or to setup a showing, please contact listing agent Meghan Webster. 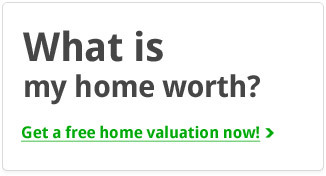 Click here to see more homes for sale in I’On.